This morning on the Aurora we headed out to the middle of Stellwagen Bank. It was grey and calm but luckily the rain never came. We spotted several blows in the distance and when we went to investigate it was four fin whale traveling at high speed. Fin whales are the greyhounds of the sea and can reach much greater speeds than other whales due to their streamlined shape. It was unusual to see multiple traveling together like this. 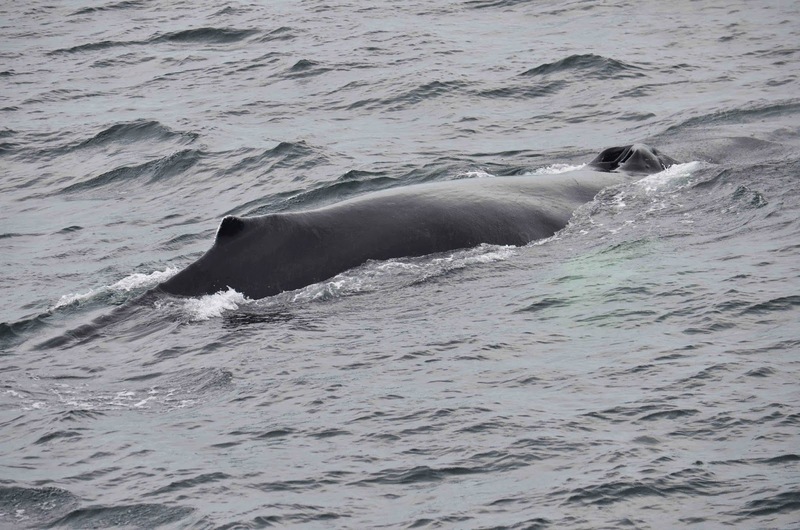 One of the whales had a scar on its dorsal fin which looked quite similar to a well-known fin whale called Fjord. Seeing known animals is always beneficial because we can learn more about their individual habits and behaviors which in fin whales is more challenging due to the subtle differences we use to identify individual animals. We moved on and found a humpback named Hancock. 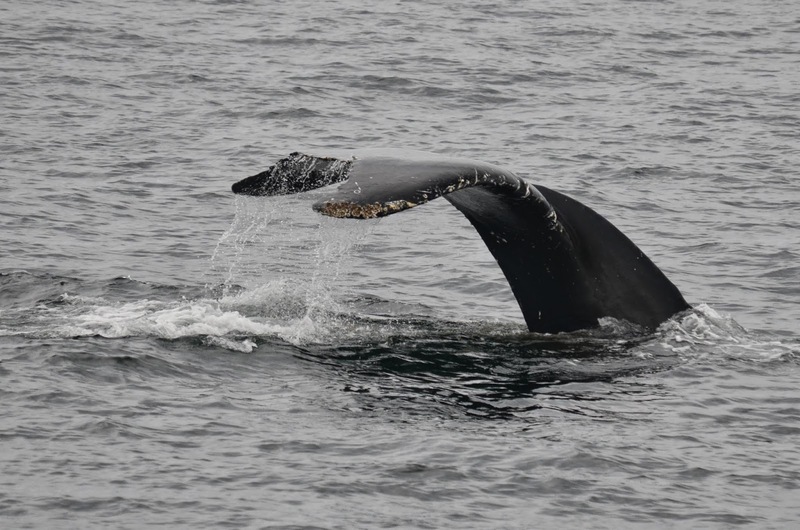 Hancock was one of the first humpbacks sighted this year. She is a full grown female born in 1991 to Clipper. Hancock was feeding near the eastern edge of the bank and was doing incredibly consistent bubble rings and emerging open mouthed through the rings. It was a lot of fun to try to figure out where she would come up next. Just don’t trust the gulls! It was a great day on the water with Hancock. 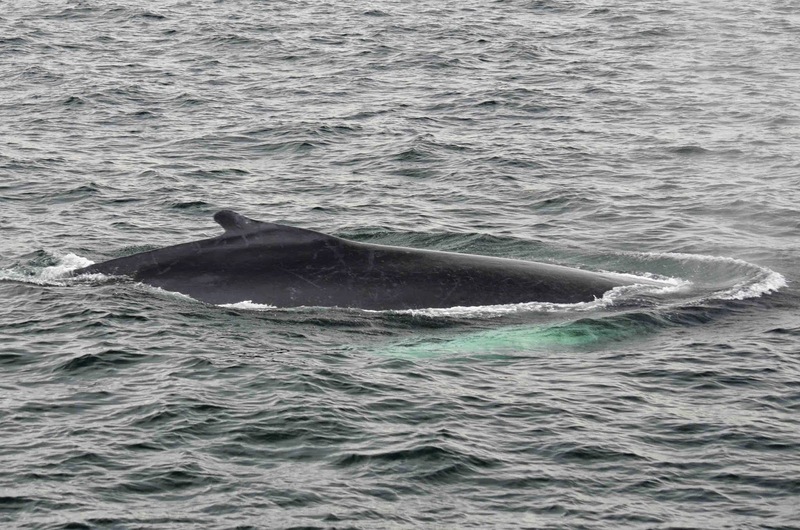 On our 1:30 whale watching trip on board the Cetacea today, we went out to midbank where first saw an enormous fin whale! This fin whale was exhibiting some unusual signs of subsurface feeding using small bubble clouds. While the use of bubbles for feeding in humpback whales is commonly seen and well understood, it is much less so in fin whales. From what I saw, this whale was likely doing some underwater lunge feeding! After one quick feeding session, the behemoth fin whale surprised passengers on the bow by surfacing right off our starboard side! Further out, Mogul and Cajun were traveling slowly together seeming pretty subdued. Judging by the birds in the area, they may have just finished feeding. Shortly after our arrival, the duo split and we stayed with Cajun who continued to make casual fluking dives. 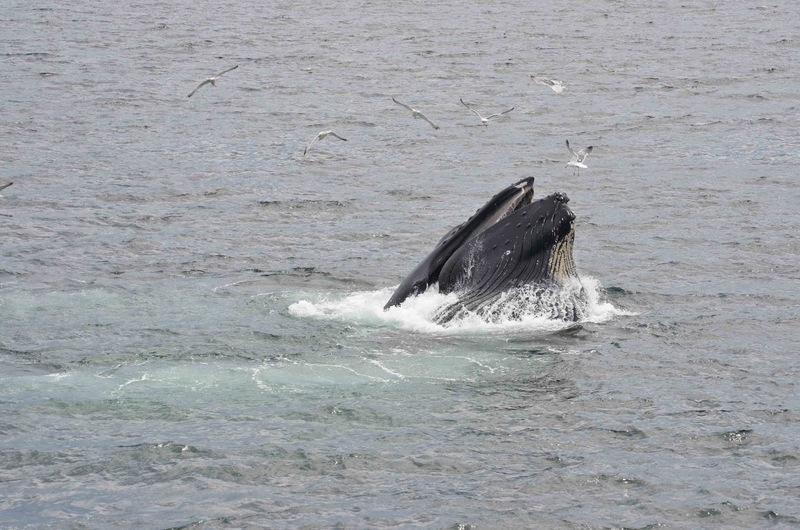 It was really nice to see Mogul since he was one of the few humpback whales that was around quite a bit last year. Based on sighting reports from around Massachusetts Bay, Mogul has just recently arrived to his feeding ground. Mogul was sighted for the first time this season just a few days ago thanks to ID work done by our naturalist Hannah. It’s always exciting to see whales come back season after season! After traveling to a blow in the distance, we also found female humpback Hancock who was fluking each time she came up for a breath of air. 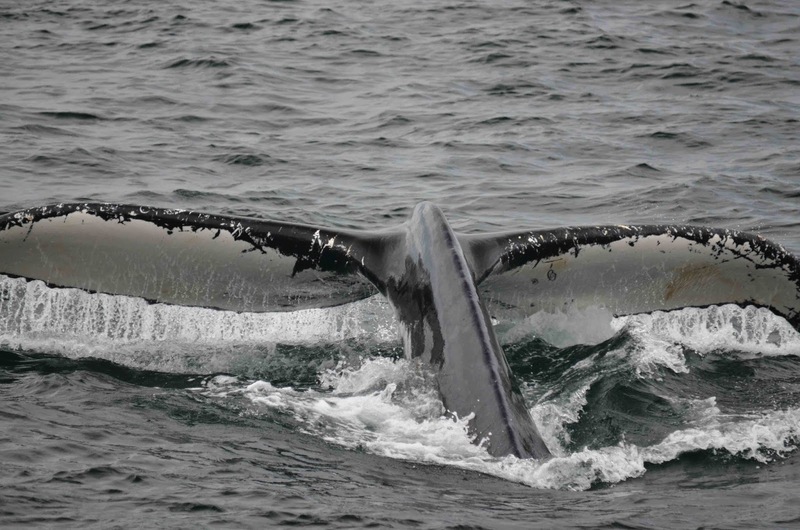 Usually when a whale flukes, it’s an indication that they are diving but Hancock was surfacing immediately after each fluke. This behavior is likely evidence of subsurface feeding as shortly after she made a couple bubble nets for herself. Unluckily, she started feeding as soon as we began heading back to Boston but I’m sure we’ll see her feeding again in the coming days! Overall, it was another great day on Stellwagen Bank!